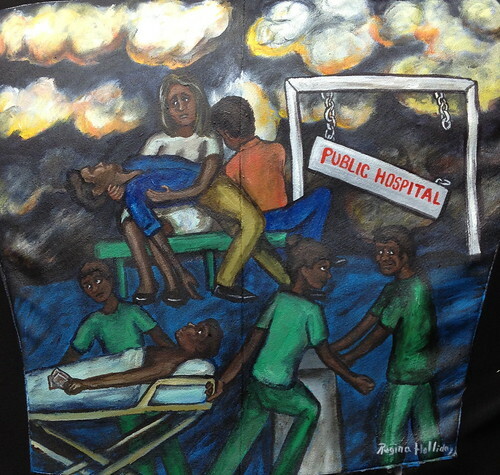 I was honored to paint a jacket for fellow widow Alice Mwongera. You can find her on twitter as @voice_patient or on Facebook. She decided to speak out and try to change the world. Alice lives in Nairobi Kenya and a few years ago her husbandwas very ill. His kidneys were failing and in desperate need of dialysis treatment. They went to the public hospital. Their private insurance was depleted due to her husband’s long illness and there were no other choices. They waited for six hours in the busy waiting room. In that room they waited, knowing each minute the condition worsened. In that room a marriage and a life ended. Alice’s husband died without receiving appropriate care. She went home a new widow to care for her young daughters. Soon tragedy struck again. Six months after her husband’s death Alice’s brother Morris Moses developed a bad cold and began to have trouble breathing. They could not afford the payments a private hospital would require so Alice and her brother went back to the public hospital in despair. He needed ICU care and his subsequent treatment was substandard. Morris slipped into a coma. When Alice asked about treatment plans and diagnosis the staff decided to dump Morris in the standard ward. He died 20 days later, having wasted away. His diagnosis was never determined. Alice decided to a very brave thing. She quit her human resources job and began to fight for the right of all patients. She realized in her country, like many others, the healthcare system is broken. She has vowed to be silent no more. I painted her at the beginning of her struggle. Here in the chaos of the waiting room she holds her husband in her arms as her brother leans upon her shoulder. The staff moves busily by not hearing her calls for help. Alice has a small organization called the Morris MosesFoundation, but she counsels other activists to do something to change things. Do not worry about the money or wait for funding; focus on action and spread the word. I think Alice and I have much more in common than just being widows. We may be a world apart but I agree to enact system change we must speak out. Nothing will stop us. 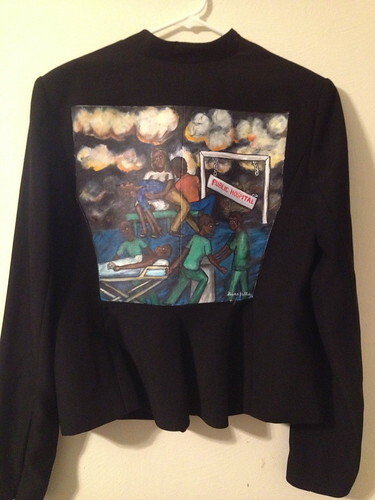 Thank you Alice for being our first Kenyan member of the Walking Gallery. And again, another powerful story that, was only ble to "open at the close." <3. Valley OBGYN Medical Group Inc.